Thanksgiving is all about family, food, and fun (and football for you sports fans). We love Thanksgiving because it’s less about buying more stuff (except food, of course) and more about spending quality time with family. But sometimes, getting the whole family together at the same time in the same place creates friction that can really put a damper on the festivities. If last year was any indication of how your difficult family members get along – or don’t, here’s how to make the most of it this year. Even if everyone at your Thanksgiving table is “on the same side” of the political spectrum, talking politics is such a hot-button topic these days that we’re all better off leaving those conversations at the door. If Uncle Johnny went too far with his comments last year, or if he’s been on a political tirade lately, you’ll want to head him off at the pass. In other words, set a no-politics rule at the beginning of the night. Let everyone know that you’ve come together to enjoy one another’s company—not to argue or complain. If you set the rule early, aside from an occasional snide remark or two, you should be able to get through the night smoothly. You’re about to spend a few hours with your family—the ones who know and love you most. And yet, our family members seem to be able to push our buttons the most. Politics aside, Uncle Fred never fails to mention the extra pounds you’ve put on. Or maybe your siblings don’t agree with your lifestyle. Or maybe the kids always end up crying before the end of the night. Instead of getting wrapped up in the drama, set an intention to sit back and take it all in without letting it take you down. Stay present to the conversations you have and the ones around you. Listen to grandma tell the story for the fortieth time about how she and grandpa met. Instead of thinking, “Not this again,” really listen. Watch her eyes light up. Notice how she moves. Sometimes simply staying present to the people around you can help you to not get wrapped up in your responses to what they say and do. It can change your entire experience. It’s Thanksgiving. As we near the end of a full year, it’s a great time to reflect on what you’re grateful for. As you stay mindful throughout the night, notice what goes right. Your host likely put a lot of work into the meal. Take some time to offer gratitude. The food—most of it, anyway—is delicious and abundant. How lucky are you that you get to feast like this? 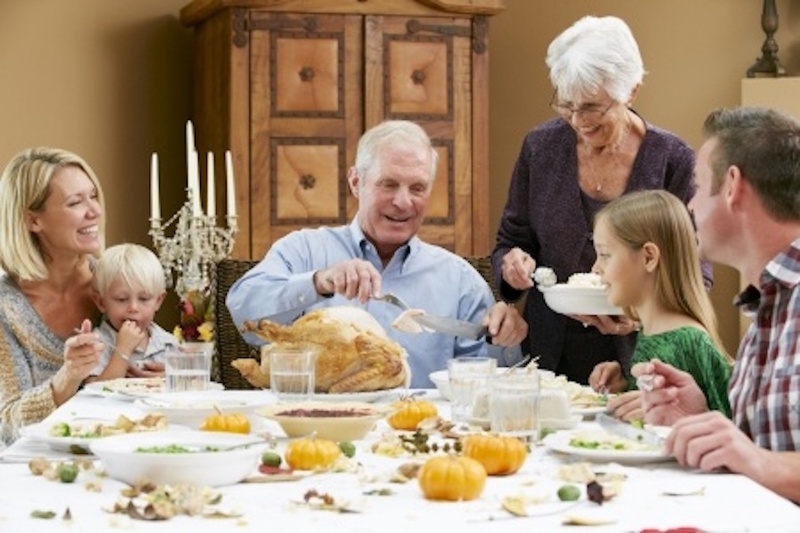 Once everyone begins eating, go around the dinner table and ask each person to recognize something they appreciate about the person sitting next to them. We’re often quick to criticize and find it more difficult to focus on the positive. Thanksgiving is the perfect opportunity to reverse that tendency. You could even make it an annual tradition. I hope these simple tips help you enjoy your holiday dinner a little more. Good luck!